What makes Indian weddings so unique? Colors, flowers, music, garments, food, crowd? No. It is a meaning which is put in every single word, move and object what makes you cry, laugh, think and experience all possible human emotions, sometimes all at once. And if you start feeling that you’ve experienced it all by the end of the second day – wait for the main day to come and you will understand that you’ve been barely scratching the surface till now. 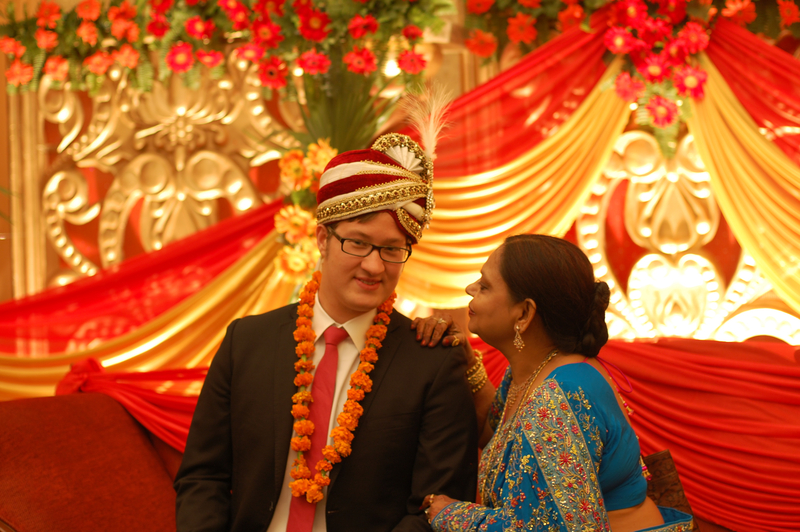 Weddings in India are not just about a Bride and a Groom, it’s a family affair. The whole family gets together for the important days of their children and with little rest they engage themselves in rituals and celebrations to ensure a blissful start into a new married live. The main wedding day in Lucknow started seemingly little differently from the previous two: instead of spending the whole day in a beauty parlor, from early morning on a beautiful bride was performing last rituals in her parental home. This is Sindoor, a red cosmetic powder which is owned by every married Hindu woman. Sindoor is one of the 16 adornments of an Indian bride and one can argue is the most important one as it is supposed to be kept carefully for the whole life. In a traditional way every married woman should apply Sindoor along the parting of her hair every single day while her husband is alive, and many women in India still do. In more modern parts of India it is not common to spot anymore, however, many women still believe that Sindoor box should be kept with a special care, as cracks on a box can symbolize cracks in a marriage. 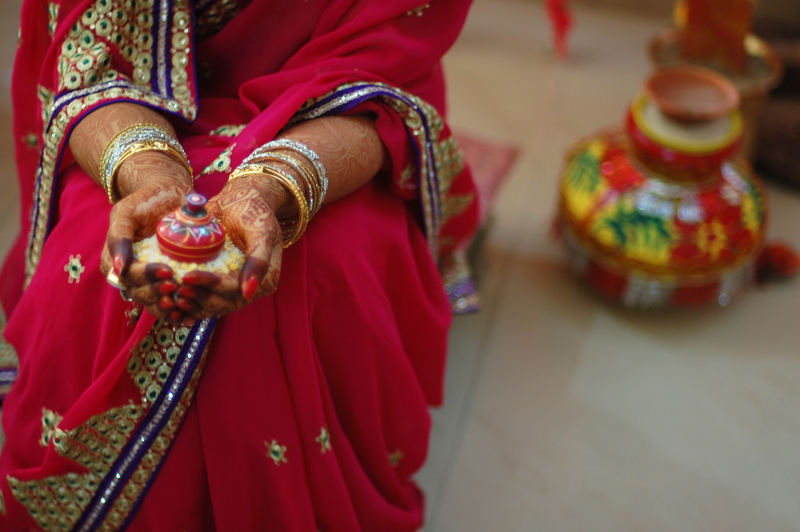 Later, during the wedding ceremony itself, Sindoor will play an important role as well, as it is applied for the first time in a woman’s life by her husband during their wedding ceremony. During the ceremony the bride received blessings from all happily married women of her family (normally, divorced women and widows would not be allowed to take part in it to avoid bad luck). 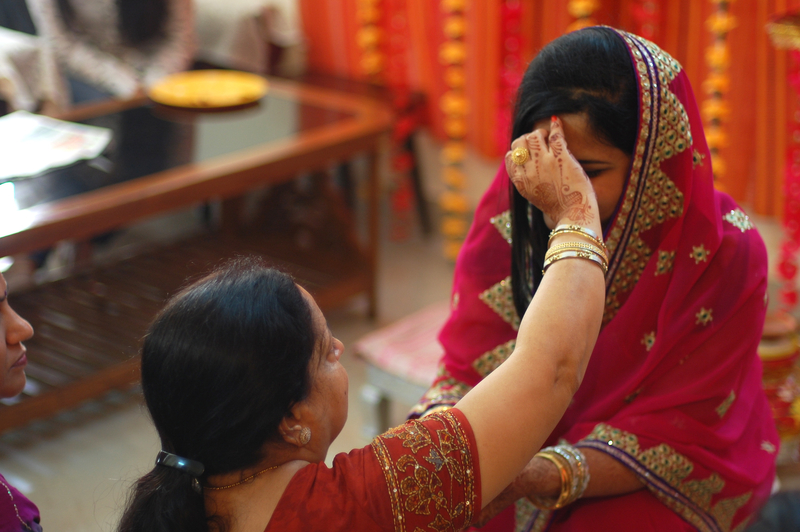 It is a very special and emotional moment: by applying a red powder to her forehead, women are sharing a part of their happiness and wisdom with the bride. … and also shared her blessings with all women in return. 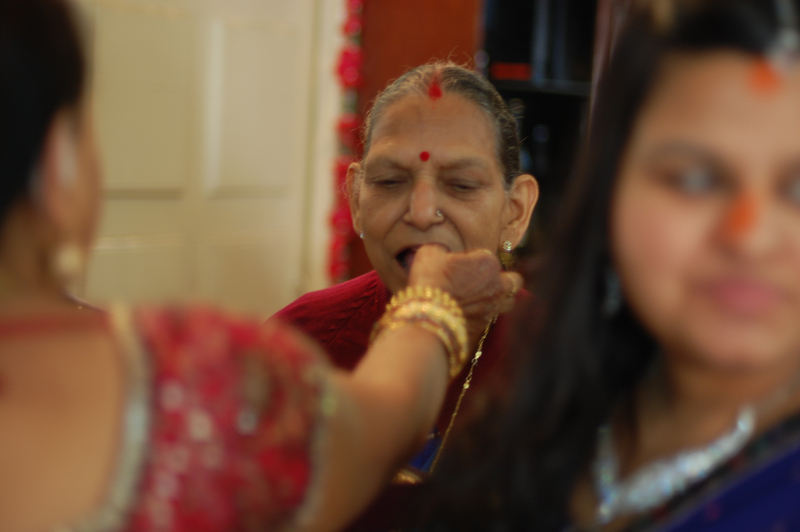 As well as may other ceremonies this one was marked with a sweet bite by all participants – after so much almond-date-ghee delight the couple has no choice but to enjoy the sweetest years of their lives together! After the first part of the ceremony was performed, the whole group, wrapped in gorgeous saris, headed to a temple to pay respect to a Goddess. In the temple the bride paid respect to the Goddess, offered her a sari and shared blessings with participants of the ceremony. These were the last rituals that the bride performed in her parents’ house as a still unmarried woman, but there was no time for emotions anymore, as there were just few hours left for final bridal preparations before the main ceremony. After months of anticipation in excitement and 2 hours of wrapping-a-sari exercise I was finally standing in front of the Lucknow Taj Hotel, surrounded by beautifully dressed people and wondering how fast time had passed. The evening was supposed to be a culmination of three days of celebrations and I couldn’t help but kept imagining how the couple was going to look like. But before I could drift away in a dreamy land of imagination a sudden and loud sound of trumpets and drums broke the silence of my thoughts bubble. The wedding had officially started. Accompanied by a band and fireworks, the proud groom on a white horse was leading a procession towards a wedding hall entrance. To spice up the whole procession guests were going nuts dancing with the drums and nobody could resist from “shaking it”. 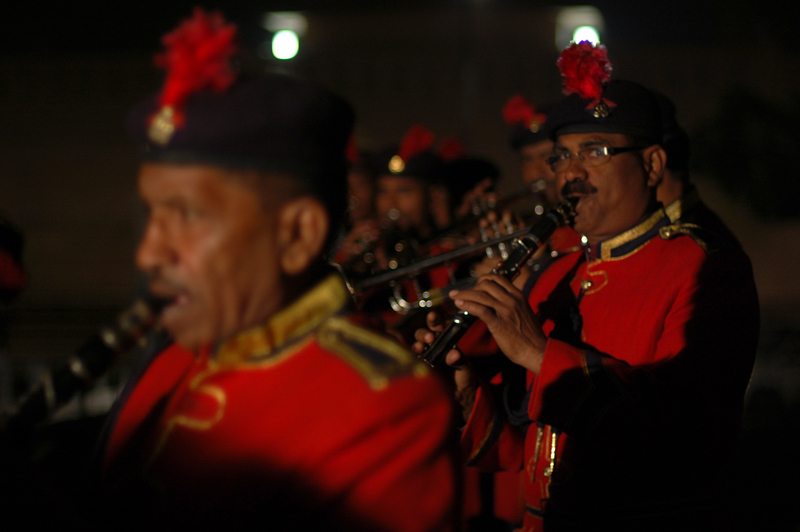 This part of the wedding is called “baraat” and it is an official entrance of the groom. When the procession arrived to the entrance the groom was greeted by the bride’s family and especially by the mother, I could not see it however, as i I had to rush to the bride’s room. I should confess: I didn’t mind as I couldn’t wait to see how the bride looked and indeed there was something to really look forward to. I entered a hotel room and there she was. Covered with gold and exotic garments, with jasmine blossoms in her hair, with a posture of a queen and a smile of a child. It was easy to steal shots of Sami – she has a natural talent for “posing without posing” and my camera enjoyed it a lot. When the final touches of her make up were done, she was ready to appear in front of her (still future) husband and that was a moment when I finally gave up my camera and followed the queen of the night along with other ladies in the direction of a sacred fire. The next three pictures were not taken by me but by Sami’s cousin – while I was busy and he was taking care of my camera, he took some absolutely fantastic shots! The next picture of the bride’s mother talking to Chris during his last moments of still being a groom but not a husband is priceless! Who knows, may be this was the moment when he received the most important advice for his future life as a head of a new family. And here she comes … the groom was left speechless after seeing her in a bridal dress for the first time. 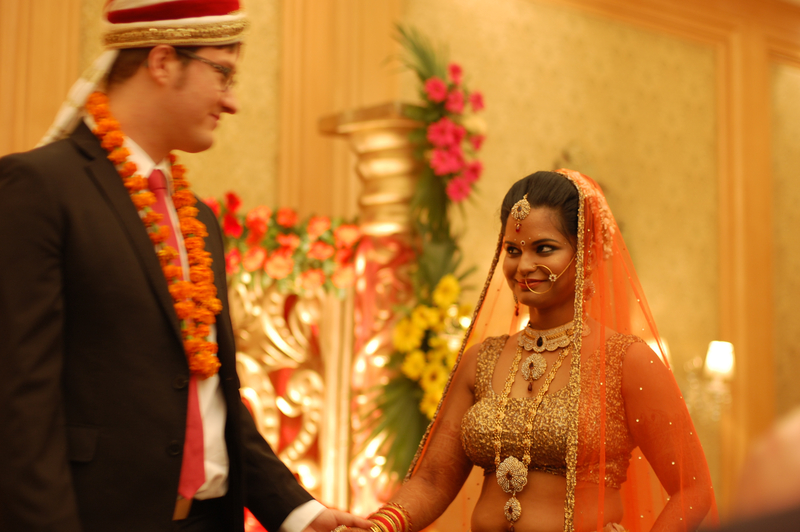 The bride’s arrival was followed by the Var Mala ceremony: the exchange of wedding garlands, which marks a formal acceptance of each other by the groom and the bride. However, as well as in a real married life, it is not all that easy! During the ceremony, friends and family lifted the bride and the groom every time they tried to put garlands on each other, making it a challenging task. They say, if it is too easy to put a garland, then a respective life partner will be obedient and weak in the marriage. After a dinner with their families the couple headed to the sacred fire where a priest was waiting for them and where the main ceremonies were to take place. Hindu weddings ceremony is a complex procedure which might not be easy to follow and comprehend if you are a newbie to this culture. The ceremony is worth another several posts to convey even a small part of it’s meaning and one day I might cover it in detail – but this time I just wanted to concentrate on the bride. Wearing of toe rings, which are mostly made of silver and are worn on both feet, are not just a symbol of a marriage for Hindu women, but also a symbol of being a sister and a wife. 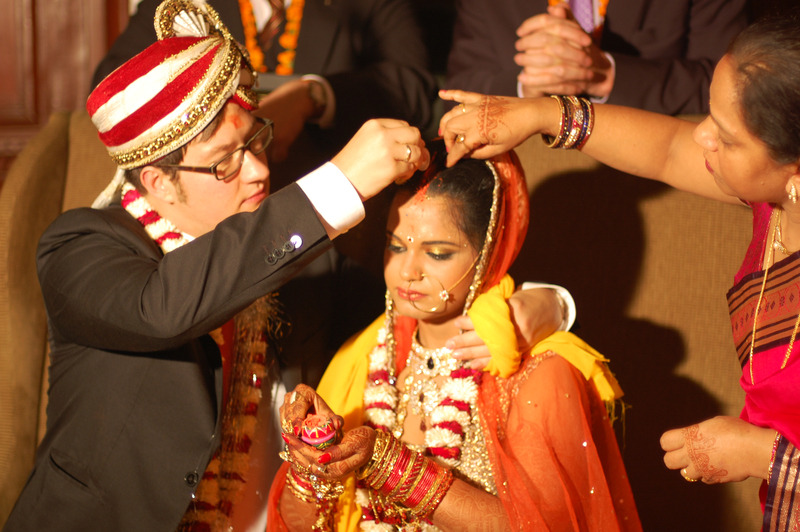 Yes, now she is his wife – Sindoor is being applied to the bride’s (already wife’s) hair for the first time in her life. The central part of the ceremony were seven circuits around the sacred fire: the bride and the groom made seven vows for their married life which tied them for life. After each vow they walked around the fire, tied to each other with a piece of clothes. After the seventh step was complete the bride, who had been sitting on the right to her groom till then, shifted to the left – it meant that from that moment on she became closer to his heart. During the whole ceremony I felt as I was hypnotized. I didn’t notice time passing by and I felt that I was a part of a truly sacred event, which was happening in a place far from the Earth, but close to the stars. Many thoughts, emotions and feelings passed through my heart and mind during those moments, but I still had the whole night and many flights ahead to spend on their digestion. At that moment I just could hug the newly weds and watch them starting a new life-long journey, but this time, together.